This 10/100Mbps PoE Switch is equipped with (8 PoE Ports+2 Uplink Port). Sturdy, compact metal casing, plug & play design, both supply data and power transmission, make your network devices connect more easily. Place these devices where they belong - high up on walls and ceiling for maximum coverage - or anywhere else you need them. 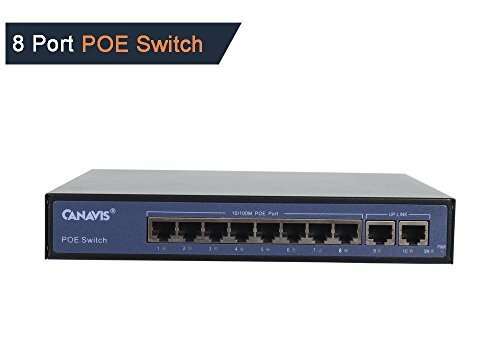 8 port PoE switch both supply power and data transmission to area with no power lines or outlets. Power and data are carried over standard Cat5 cabling. Ideal for small installations of 8 IEEE802.3af IP-based devices, like wireless security cameras or IP-based network surveillance cameras. Power input: AC100-240V 50/60Hz, 120W power available to all PoE ports, maximum 15.4w power to each PoE port. Plug and Play: The PoE Switch automatically detects IEEE802.3af-compliant devices and supplies power as needed. Front panel LEDs keep you informed of switch and PoE status. Its durable metal case make it easily positioned on your desktop or a wall with the included mounting hardware. The fan-less design quietly integrates with your small office environment. If you have any questions about this product by Casacop, contact us by completing and submitting the form below. If you are looking for a specif part number, please include it with your message.